There is total honesty in approach and brutal honesty about what’s missing. 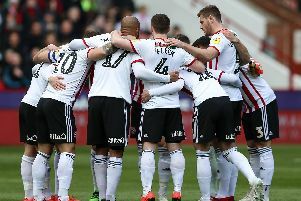 But one thing those with a critical eye on Sheffield United – all of us including the manager and board – must not lose sight of is what that missing link costs. You might be able to blur the financial margins with solid recruitment, ethics, teamwork and organisation in other areas of the pitch, but when it comes to scoring goals you are talking a different commodity entirely. And in Championship terms it costs way beyond what Chris Wilder has been able to afford. For all Wilder’s post-match candour after a superb display was wrecked by Cardiff’s late equaliser in Monday’s 1-1 draw, there is nowhere to point the finger in the dressing room. To have one striker on 16 league goals (Leon Clarke) and another on 12 (Billy Sharp) is actually better than Cardiff’s output from their front positions (Hoilett 10, Zahore eight, Mendez-Laing seven). The difference is that the team five points clear in second place have a spread of scorers throughout the team. United have little outside of the main two, so to blame the forwards is a touch simplistic. And I’d like to know how many wayward crosses there were on Monday, especially in the second half, albeit that George Baldock and Enda Stevens do sterling work at both ends in the wing-back positions. For a side with as ultra an attacking intent as United and as much delivery into the box, 53 goals in 40 matches does not begin to represent the threat Wilder’s team poses. “Not being clinical enough,” as the manager repeatedly admits, is the diagnosis and not the cure. Two things here. There’s a lack of scoring back-up for the main forwards with David Brooks falling a touch short on that front against Cardiff (yet so menacing in a stretched game from the bench) with Sharp confined to the bench. And an over-reliance on the injured Mark Duffy to contrive an opening. But where all roads lead is to the chequebook and a realisation that Wilder is extracting the maximum from this group. Being logically linked with the West Brom vacancy is a reflection of that and another spur to the hierarchy. Maintain Monday’s performance level and there is no way United won’t beat Barnsley at Oakwell on Saturday. Following that comes a home double-header against play-off rivals Middlesbrough and Millwall. The gap to the top six currently is a single point. United are still over-achieving massively on a lower end budget. All they can do is keep playing to these levels. If they do, it should go to the wire.